Sonoma County Sheriff Rob Giordano and Santa Rosa Fire Chief Tony Gossner were among those in attendance last night, Thursday, Jul 19, for the world premiere of the new documentary “Urban Inferno: The Night Santa Rosa Burned” at the Roxy Stadium 14 in downtown Santa Rosa. 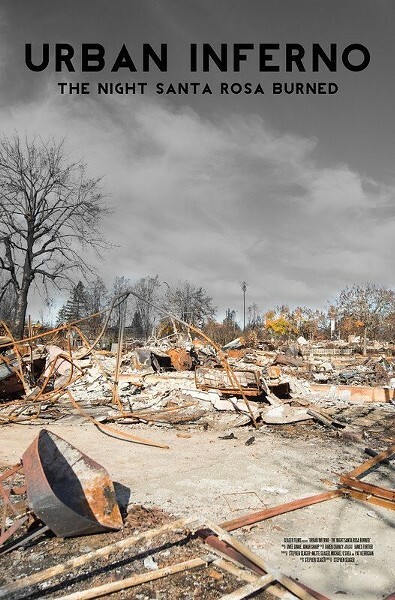 Now screening daily at the nearby Third Street Cinemas, the 40-minute, locally-produced documentary recounts last October's devastating Tubbs Fire, the most destructive wildfire in California history, and focuses on the initial impact of the fire on Santa Rosa. Speaking alongside director Dr Stephen Seager, a longtime Santa Rosa resident, and co-producers Metta Seager, KSRO president Michael O’Shea and KSRO news director Pat Kerrigan and others, the sheriff and fire chief took questions from the local crowd who attended the sold-out premiere and heard from others who shared their experiences. 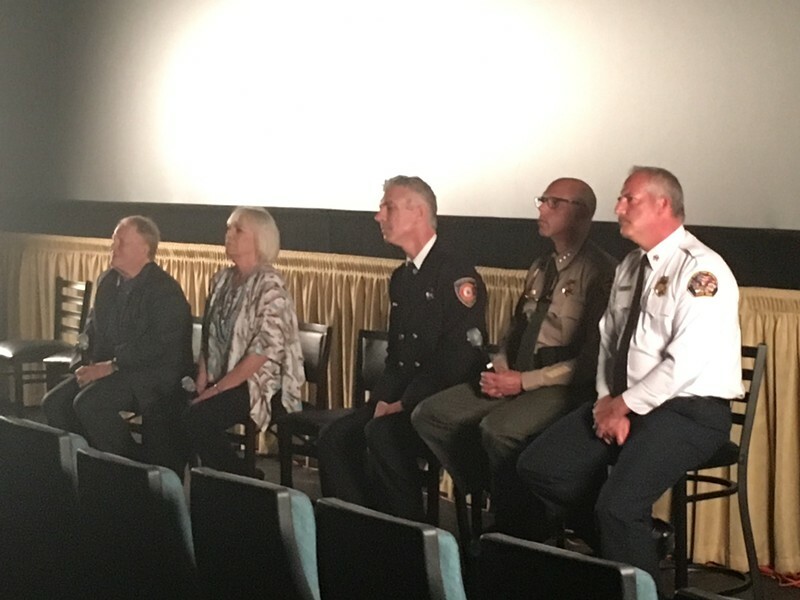 (From left to right) KSRO president Michael O’Shea, news director Pat Kerrigan, Berkeley firefighter Mike Shuken, Sonoma County Sheriff Rob Giordano and Santa Rosa Fire Chief Tony Gossner attend the premiere of "Urban Inferno." Told through on-camera interviews and raw video compiled from cell phone footage, police body cameras and other sources which captured the firestorm that swept through parts of Santa Rosa in the late night and early morning of Oct 8-9, 2017, "Urban Inferno" is at times harrowing and heartbreaking, though it deftly tells the complex story of the unprecedented event and highlights the heroism that rose up to meet the chaos. In particular, the film explains how Gossner's decision to focus on evacuation over firefighting likely saved hundreds of lives. "Urban Inferno" also shines light on the work of the news staff at KSRO 1350 AM, who broadcasted commercial-free for 24 hours a day as the fire unfolded and who largely became the only line of communication for thousands of Santa Rosans forced to flee their homes. For some in the audience, the screening was a raw reminder of last October's events, and footage of destruction was met with gasps at times, though the film takes a respectful and hopeful tone. "Urban Inferno" opens today, Jul 20, with regular screenings, and all proceeds from the premiere and the subsequent screenings will go to the Sonoma County Resilience Fund. Click here for times and tickets.